Talking Cat Dynamics: Are some cats just hard wired? Has this ever happened to you? You’re getting ready for another day at work and you decide to wear your favorite blouse…the very same blouse that has been sitting on the back of your chair for a week because you were too lazy to put it away after you got it back from the cleaners. As you put your arm through the sleeve, you notice there is a soggy hole in the side. Your cat has chewed another chunk out of your wardrobe. What the @*%!?!?! Guess what? Your cat is not hungry or trying to piss you off. Chances are, your cat has PICA! Pica is the term for the repeated ingestion of non-food objects. Accidents will happen, this is true. 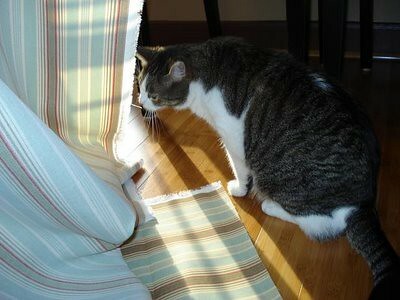 Sometimes cats will unintentionally eat an object like yarn, string or even a plastic cord. It probably looked like a snake to them? Can you blame them? Pica is quite different and happens when cats deliberately chew and swallow inedible materials. Common targets include wool blankets, plastic coated wires, rubber, plastic bags, even thumbtacks, hair ties & spare change . Often, individual cats will have different preferences- so the cat that eats wool may not eat rubber, or the cat that tries to eat your bobby pins may frown upon your hipster sweater. Some cats have a broad range of preferences. Though it might seem amusing to some people, it could result in a lethal ingestion for your cat. Yarn can get wound up in the digestive system and plastic can obstruct major organs. Luckily, most of the time, PICA is more annoying then it is deadly. No one wants to come home to find a huge soggy hole in their favorite shirt. Unless of course, you’ve just been shot, in which case, you need to call 911 immediately. What causes this disorder has been subject of debate among vets and behaviorists. Some attribute it to a lack of fiber in the diet while behaviorist’s may claim that it is caused by boredom or anxiety. 1. Remove targeted items – Placing clothing, blankets, plastics and electric cords out of the reach of your cat is often the easiest solution. Storage containers, electric cord guards, and other useful items are available at most home supply stores. The upside of all of this is that your house or apartment is going to be super clean! NO MORE CLUTTER! I wish my cat had PICA. It would be great incentive for my wife to stop collecting shoes. 2. Provide alternative items to chew or eat – Food-dispensing toys, durable cat toys, or pieces of rawhide can be used to redirect your cat’s chewing behavior to more appropriate and safe items. For cats attracted to houseplants, small flowerpots of grass or catnip can be planted and kept indoors. 3. 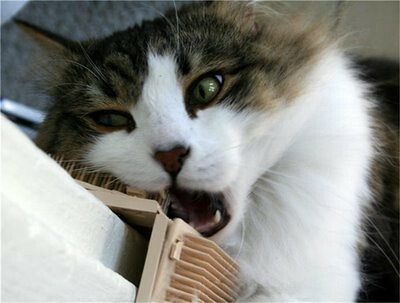 Provide lots of structured play – Many cats chew on household items out of boredom. 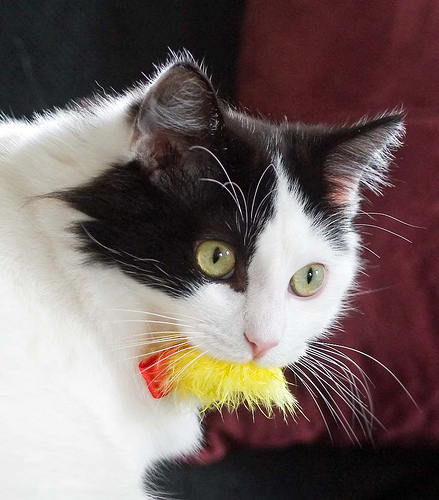 Provide interactive toys and set aside time each day to play with your cat. As mentioned in many blogs prior, exercise, play and environmental enrichment provide stimulation that will cure most miss-behaviors. A bored cat has more time to focus it’s energy on misbehaving while an active and distracted cat will not have the time of day to devote to such foolish activities. 4. Increase dietary fiber – It may help to increase the amount of fiber in your cat’s diet. High fiber foods usually contain fewer calories. Your cat may be able to satisfy their craving to eat more while still maintaining their weight. Consult with your veterinarian before making any changes to your cat’s diet. 5. Make targeted items aversive – Occasionally, applying aversive substances (e.g. 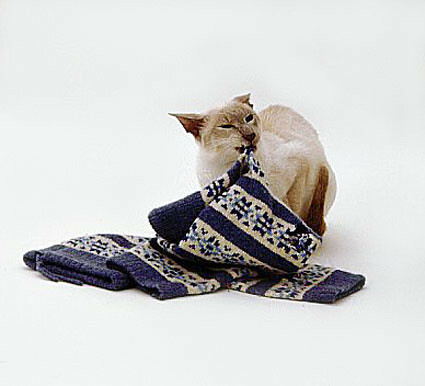 hot sauce, Bitter Apple®, Bandguard®) to an item may deter a cat from chewing it. If this is not possible, spraying strong smelling substances (e.g. citrus air freshener, potpourri) or using physical deterrents (e.g. 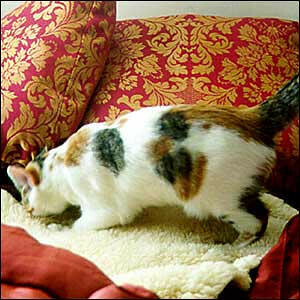 upside down carpet runner, compressed air or Ssscat®,) around an object may prevent cats from approaching. Eventually, your cat will get tired and stop heading for the same places of obsession. Just be extra careful with aversive techniques. Many times they do more harm then good and can confuse the issue. 6. Consult with a veterinary behaviorist – If your cat continues to ingest non-food items, referral to a veterinary behaviorist is recommended. Further environmental and behavior modification plans, specifically tailored to your pet, may be needed. In some cases, medication may be helpful. Anti-anxiety medications can lower stress levels and help to subdue the ingestion of non-food items. Hopefully, with the right guidance and a little bit of tidying up, your cat will no longer bite off anything bigger than they can chew! Buy more cat toys!!!! No cat ever complained about too much enrichment in their lives. It’s up to you to listen to their demands, even when they are unspoken…and most of the time…they are.